A pair of small gold eyes peers out from under a mass of sphagnum moss. In a day or two, this warty creature will complete its climb out from the depths of the sandy soil where he has spent the last 30 days sleeping and “chilling” at a cool 38 degrees. Along with seven other individuals of this species, he will awaken due to an increase in temperature and light. By the time the temperature reaches 74 degrees, he will have completely removed himself from the soil and be sitting atop it, hopefully alongside his companion, a slightly larger female. In the week that follows, events these two small cold-blooded creatures will go through could lead to producing thousands of their species in a matter of hours due to their “explosive” nature. The Wyoming toad (Anaxyrus baxteri) is one of North America’s most endangered species and one of the amphibians we work with as part of a Species Survival Plan (SSP) at the Detroit Zoo’s National Amphibian Conservation Center. This toad’s wild populations began declining in the 1970s, and by the 1980s was listed as an Endangered Species by the International Union for the Conservation of Nature (IUCN). 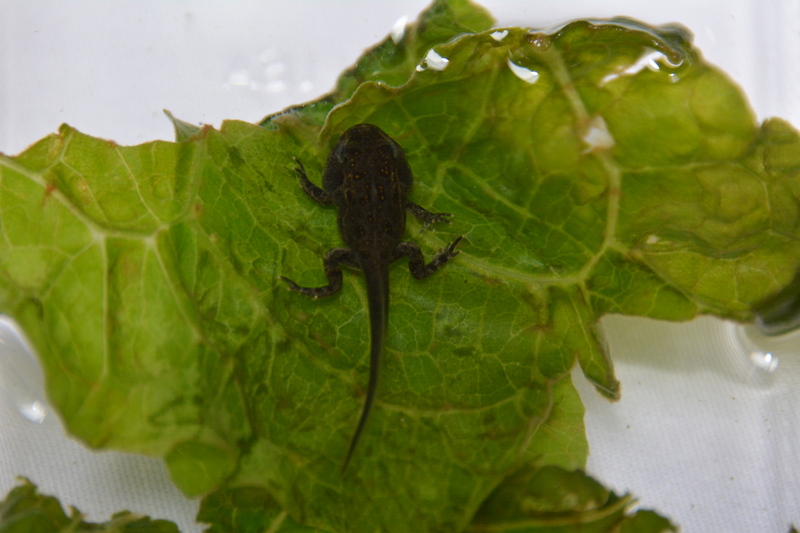 Possible causes for the population decline are use of aerial pesticides to eliminate mosquitoes, habitat manipulation, and disease in the form of the amphibian chytrid fungus. Realizing a decline was occurring, the last remaining toads were collected and by 1994, all remaining wild-born Wyoming toads were believed to be entirely in captivity. The IUCN now describes the Wyoming toad as extinct in the wild, meaning any toad currently found in the wild has come from captive breeding, in which the Detroit Zoological Society (DZS) has been actively involved. 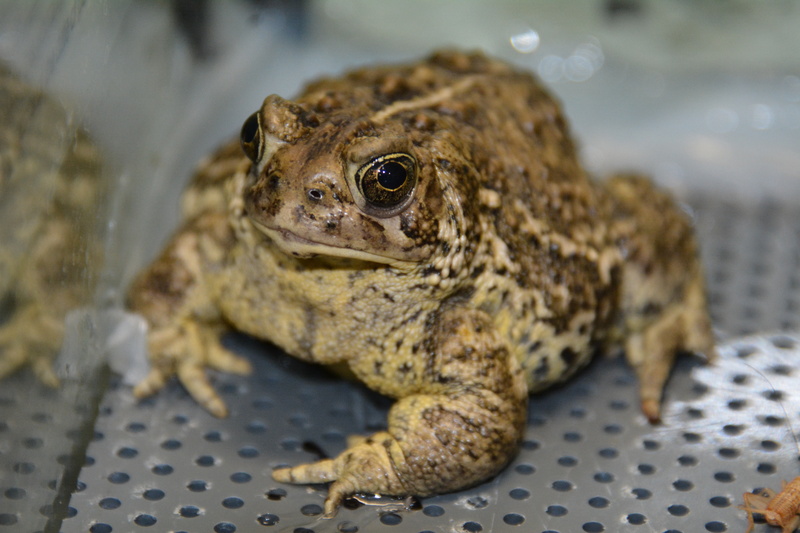 The Wyoming toad SSP is managed by the Association of Zoos and Aquariums (AZA). The DZS has been a member of this conservation program since 1995 and since 2001 has sent a total of 6,505 tadpoles and toadlets to the wild. All Wyoming toads are the responsibility of the U.S. Fish and Wildlife Service (USFWS), so members of the AZA work closely with them to follow all USFWS permit guidelines for keeping them in captivity. The goal of any captive breeding program is to produce healthy offspring for release into the wild with the goal of rebuilding them into a self-sustaining population. Each toad in captivity is identified and tracked, which helps to pair toads that will produce the most genetically diverse and healthy offspring. Breeding pairs of toads are chosen almost a year in advance so toads have plenty of time to move from one zoo to another to create the breeding pairs. Although not as well known as Jabari and Kivuli, the giraffe couple at the Detroit Zoo, Wyoming toads Butler and Beverly are a very important couple of toads. They are part of a “bio-secure” population and will never be seen by the public, which ensures they will not accidentally release diseases, known or unknown, into the wild via their offspring. They are held with four other pairs of Wyoming toads in a special room away from all other amphibians, so they will remain free of diseases that could otherwise be found in species not native to the western region of North America. At the AZA’s recommendation, Butler arrived at the Detroit Zoo last October to be paired with Beverly, who arrived in 2012. Both are now 3 years old, which is about middle aged for a Wyoming toad. In early April, they were placed together into a thermostat-controlled “hibernaculum”, which is used to cool the toads, simulating the hibernation period a wild Wyoming toad would go through during the winter. The toads are kept cooled for about a month to help prepare them for breeding; eggs or sperms may develop and mature as a result of this cooling. The toads are given plenty of sandy soil to bury down into and sleep in just as they would have in the wild, and the Zoo’s animal care staff checks in on them weekly to make sure they are doing well. At the end of May, the temperature in the hibernaculum will be increased to 70 degrees Fahrenheit and the toads will begin to awaken. Once they have climbed out from the soil, we will place them back into regular husbandry for a few days where they will continue to warm up and eat. Recordings of male toads calling are played during this time to condition toads further for breeding. Within a few days of emerging from hibernation, Butler and Beverly will be placed into a breeding chamber with 2-3 inches of water. The pair will hopefully go into “amplexus” within a few hours, which happens when the male positions himself on top of the female using his front legs and squeezes her, encouraging her to lay eggs. He fertilizes the eggs as she lays them, usually in the dark, overnight. Butler and Beverly should lay thousands of eggs, which is typical of toad species. Described as “explosive breeders”, the more eggs they can lay the better the chance offspring have of surviving the elements, diseases and predators. Since this is a captive breeding, we can help the thousands of eggs that Butler and Beverly produce survive into strong, healthy tadpoles. 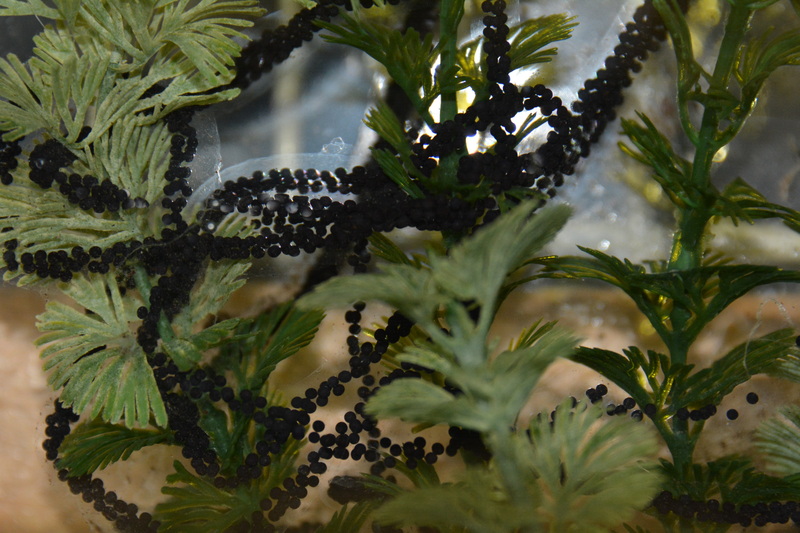 Approximately two to three weeks after eggs have hatched into thousands of hungry tadpoles, arrangements are made with the USFWS to ship the tadpoles to Wyoming, where they will be released into protected wetlands. 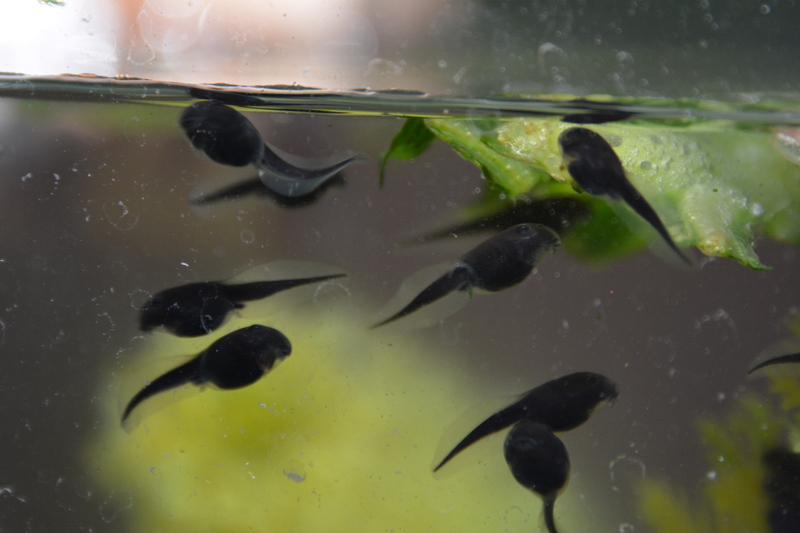 These tadpoles will add to those previously produced in captivity sent yearly by the zoos that participate in this program and the USFWS. The wetlands are monitored during the spring and summer as part of yearly field surveys done to track the health and population of the toads. This year we hope that Butler, Beverly and the three other pairs of Wyoming toads at the Detroit Zoo are able to contribute thousands of healthy tadpoles to the wild population. We battled frigid temperatures as we entered the ice-filled water wearing insulated waders for protection against the elements. This dramatic introduction sounds like the start of an exciting adventure story in some far-off place, but it actually describes some of the unbelievable conditions right here in Michigan where you can find one of the most fascinating creatures – the common mudpuppy (Necturus maculosus maculosus). This four-legged, fully aquatic amphibian can be found in rivers, lakes and ponds throughout the midwestern U.S., including the waters of the Detroit River. The Detroit Zoological Society (DZS) is actively engaged in many field conservation projects, including surveying the common mudpuppy around Belle Isle. Our amphibian department has conducted surveys since 2009 as a way to learn more about the overall health and population of the salamanders found in the area. Fieldwork for the project is conducted twice monthly at two different sites, and it is never to be done alone; due to the danger posed by the elements, there must always be two people working on the survey. 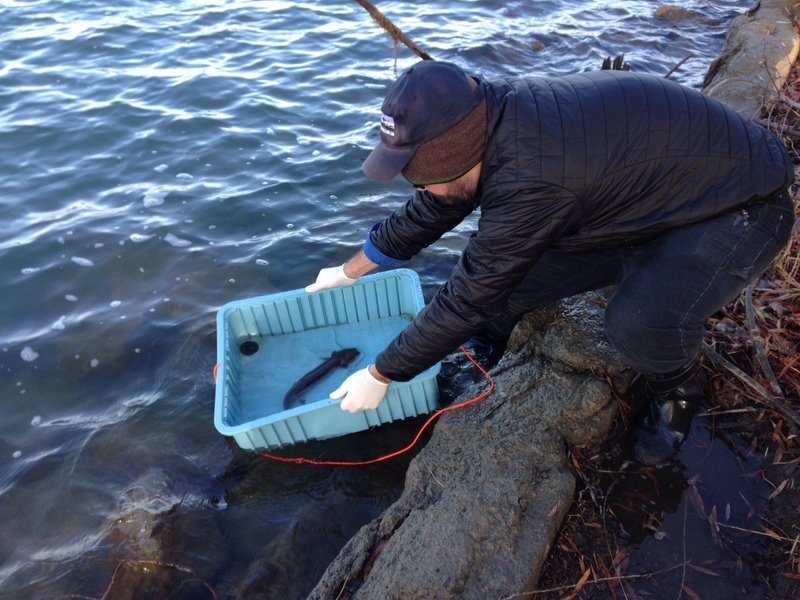 Depending on the weather conditions, surveys at times are limited to collecting water samples; other times it can involve trapping and processing mudpuppies. Listed as Least Concern by the International Union of the Conservation of Nature (IUCN), little is known about the true population size of mudpuppies – not just in Michigan but also throughout its entire range. Even though this aquatic salamander has a pair of lungs, it uses blood red, feathery gills located on the sides of its head to gain oxygen from the water. It has a rather flat body and wide head and it uses its tail to move through the water. Mudpuppies prefer to hide under rocks and logs during the day and forage on aquatic insects, crayfish and fish. Like all amphibians, mudpuppies are valuable indicators of wetland and habitat health. Since water and air move freely in and out of an amphibian’s permeable skin, they will be the first creatures to become sick or even die from the pollutants or toxins found in the habitat, warning us of any impending problems. 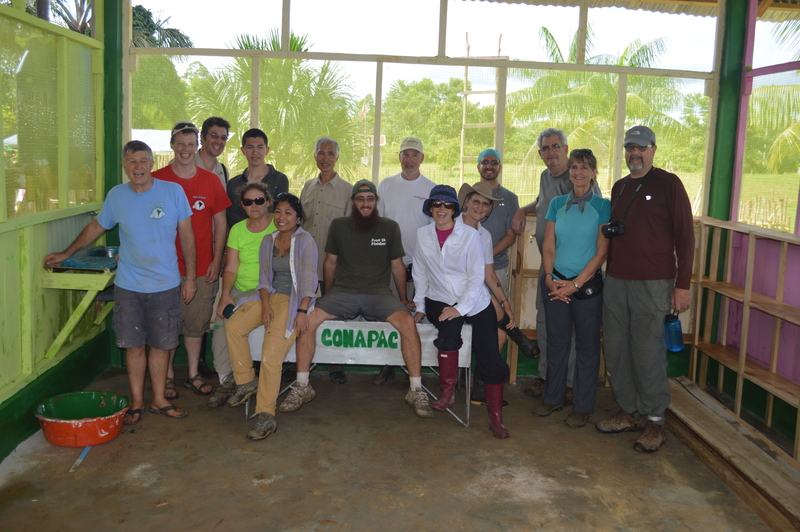 Fieldwork and data collection for this project is typically a two-day process. On Day 1, we are in the field collecting water samples and data on the weather, and also setting traps. To capture mudpuppies, we use small collapsible minnow traps that we weigh down to the bottom of the river and bait with frozen smelt. We tie the traps to the shoreline so they won’t be lost in the current of the river. We leave them overnight to allow the mudpuppies plenty of time in their undisturbed habitat to wander in, where they will remain until our return the following day. The water samples we collect are taken back to our water quality lab where we can conduct more scientific tests. 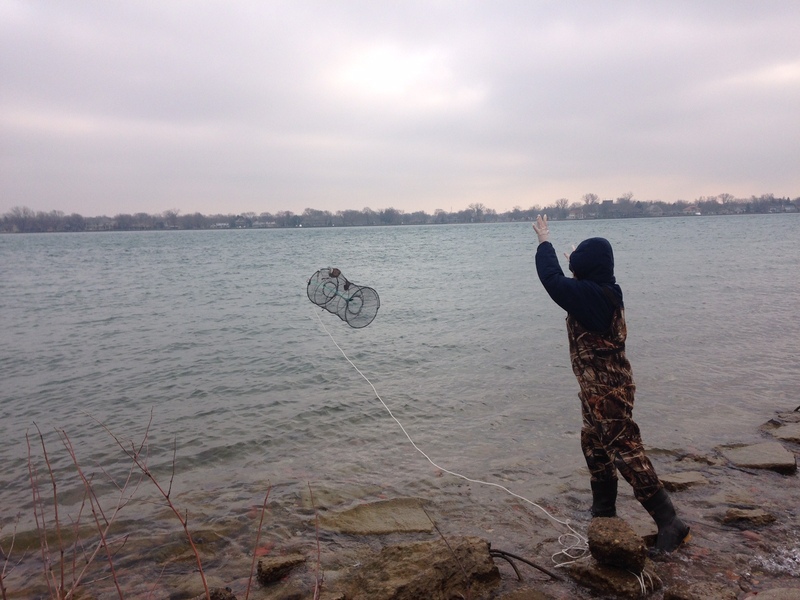 Keeping track of the water quality of the Detroit River is just as important as the data collected on the mudpuppies themselves. A database of this information will help us notice if severe changes have occurred in the water over time. 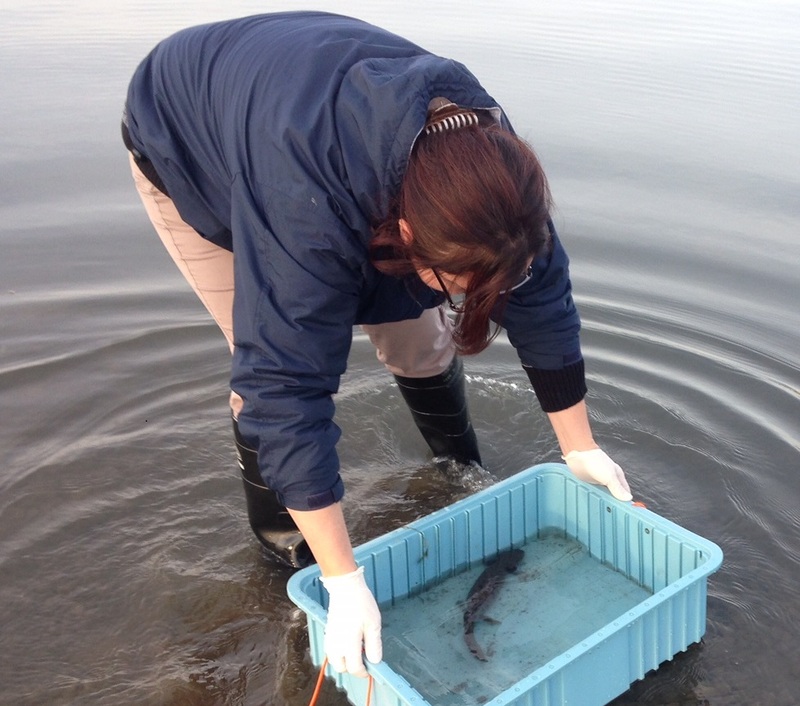 On Day 2, we return to the field to collect the traps as well as information on any mudpuppies captured overnight. In the winter, the coast of Belle Isle can be quite treacherous. On one particular day in March, we faced some challenges as ice floes had moved into the shore overnight and were covering the traps we’d placed the day before. I was accompanied by two of the DZS’s most seasoned field researchers: Paul Buzzard, the director of conservation, and Marcy Sieggreen, curator of amphibians. 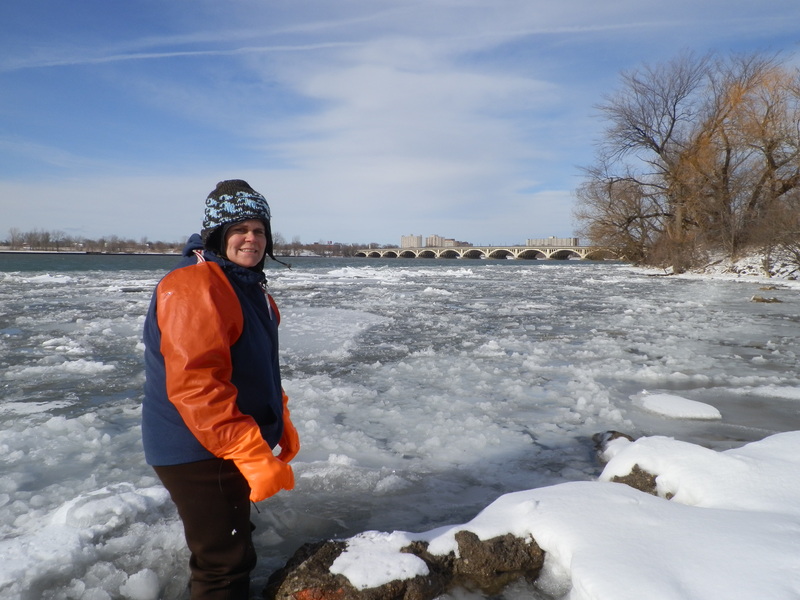 Wearing insulated chest waders and long gauntlet-style gloves for protection against the icy waters, we did some ice stomping and managed to locate and recover all the traps we’d set. 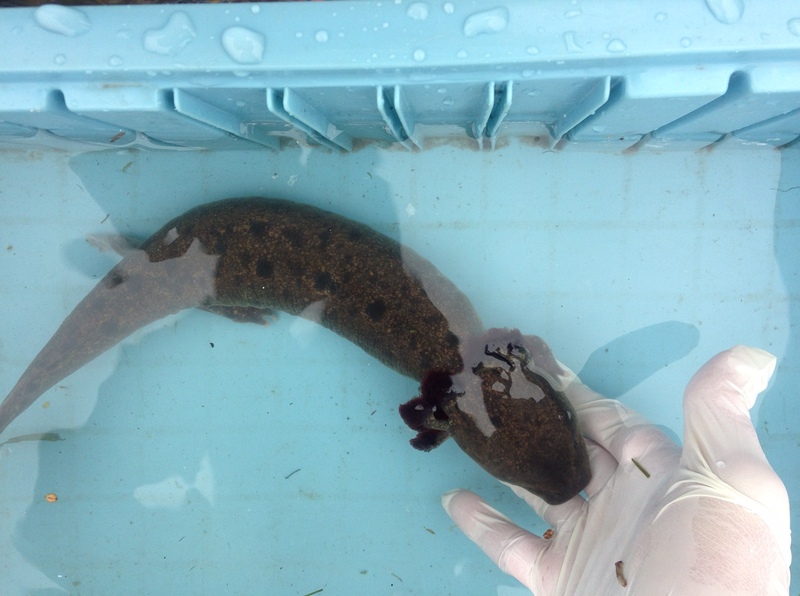 Turned out we had captured one mudpuppy, so we proceeded to gather additional data – information from the animal, weather conditions and the water. We needed to take great care to keep the mudpuppy in the water at all times; in the winter this protects the skin and gills from freezing and in the warmer days of spring, summer and autumn it protects from the heat. We take measurements, weight and pictures of the animal, and if the salamander is healthy and large enough, a small transponder is implanted in the side of the tail to help with identification if recaptured. As quickly as possible, the mudpuppy is returned to the water in the area where we found it. On Day 2, if conditions are favorable, we also use a digital boroscope to survey the site further. A boroscope, or a “plumber’s camera” as it’s sometimes called, is a camera at the end of a flexible 5-foot-long cable connected to a video screen. We use it to peek under rocks and logs in search of mudpuppies. This tool is a non-invasive way to learn about what else is living in the river. As we continue with these surveys, we are exploring what other things the data we collect can show us from further analysis. We also plan to return to surveying areas off the coast off the island of Grosse Ile, which are also known to have a population of mudpuppies. Marcy Sieggreen was the curator of amphibians for the Detroit Zoological Society from 2008 until her passing in 2016. The Detroit Zoological Society established the Sieggreen Amphibian Conservation Fund in Marcy’s memory to continue to advance the work she so passionately championed. As animal lovers, when we come across an animal in need of help, we want to take action. But when we find an injured or orphaned critter, often times we’re not sure what to do. Here at the Detroit Zoological Society, we receive emails and calls throughout the year from people who want to aid local wildlife. Although we wish we could provide sanctuary for all animals in need, we are unable to do so in nearly all cases. But we think it’s wonderful that so many people want to assist these sentient beings, so we’ve compiled a list of helpful resources. The following links contain contact information for reputable organizations and rehabilitators that are able to provide support. Download the app and jot down the phone numbers found in the links. You can keep a copy on hand so that the information is available should a need arise. Animal Help Now App – Find contact information for nearby emergency wildlife assistance across the U.S., including wildlife rehabilitators, rescues and veterinarians. Remember if you come upon an animal that you think needs help, don’t address the situation without first reaching out to a professional for his or her advice. If ever you’re in doubt, call an expert. – Lisa Forzley is a curator of education for the Detroit Zoological Society and oversees the Berman Academy for Humane Education. Learn more about the Academy, which was created to help people help animals and offers a broad range of engaging programs, at http://detroitzoo.org/education/humane-education. 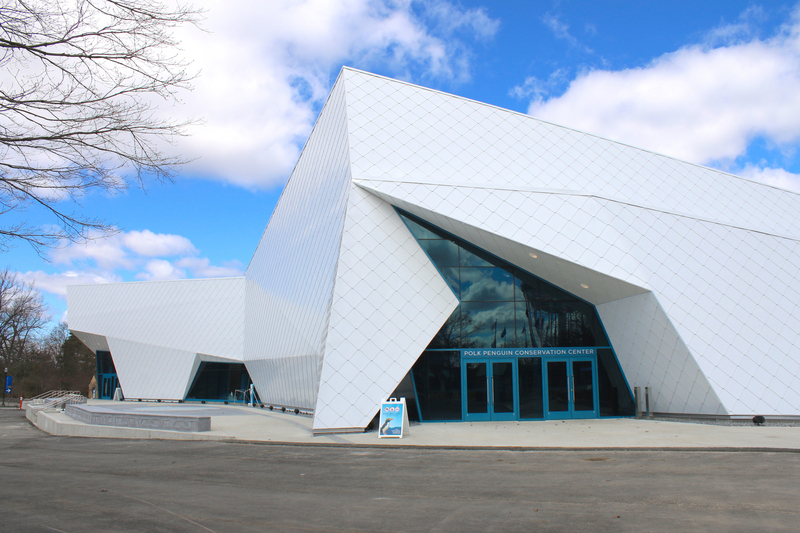 The Polk Penguin Conservation Center is not only a state-of-the-art facility for penguins – the largest of its kind in the world – but it also contains a wealth of educational information about Antarctic explorers, modern-day researchers, and the incredible, fragile ecosystems at the bottom of the Earth. During a visit to this incredible facility, visitors first enter the South American Gallery and are “met” by Sir Ernest Shackleton and the crew of his legendary ship, the Endurance. Shackleton led the ill-fated 1914 expedition to complete a transcontinental crossing of Antarctica. The endeavor became a survival story when his ship became trapped, and eventually crushed, by ice in the Weddell Sea. A dock scene tells the incredible survival story of the Endurance crew. As you descend the entrance ramps and venture further into the penguin center, you “board” Shackleton’s Endurance and cross the Drake Passage to Antarctica. You may be met with a calm sea at day, a starlit night sky or the Drake’s notorious rough seas. Continuing down the ramps, you cross the Antarctic Convergence, which occurs when the moist air above the Atlantic, Pacific and Indian Oceans meet the frigid air above the Southern Ocean. The mixing of warm and cold air causes the moisture to condense and create fog. As you make your way below deck, portholes show glimpses of Antarctic wildlife including orcas, krill and leopard seals. After passing through the acrylic underwater tunnels and the Underwater Gallery, the path brings you to a world of ice. Spotlight on Science showcases the research of world-renowned polar ecologist and penguin expert Dr. Bill Fraser, head of the Polar Oceans Research Group, and the importance of sea ice for the Antarctic ecosystem. Food sources for many species in the Antarctic region require sea ice for survival. Understanding these ecological changes caused by the shifting formation of sea ice can help us protect ecosystems in the future. Across the cavernous room, Ice Core Investigations allows guests to explore ice cores, an important tool in uncovering the history of the Earth’s climate. Ice cores are drilled and excavated from thousands of years of compressed snow that has turned to ice. The air pockets trapped between layers serve as a record of what gasses filled the atmosphere over time, allowing us to compare different periods of climate history. 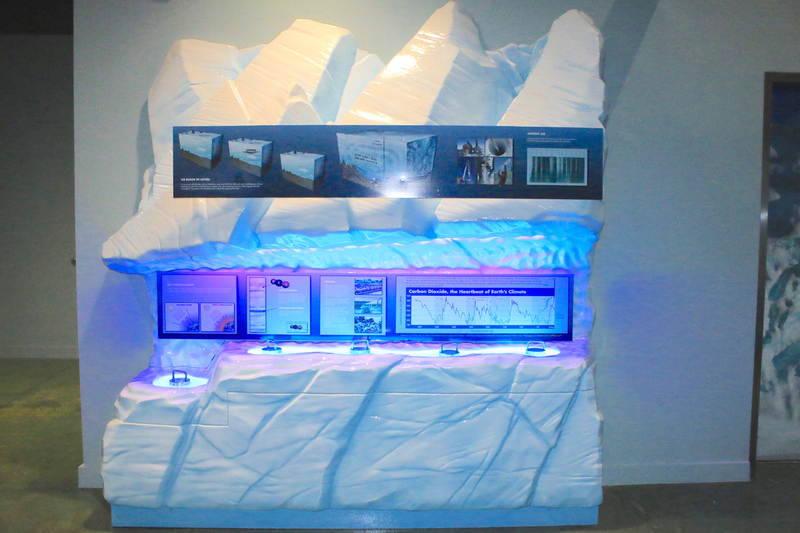 Watch for calving glaciers as you climb the stairs to the Antarctic Gallery. A glacier is a very large piece of ice that is pulled across land by gravity like a slow conveyor belt. Reaching the ocean, ice breaks off from the rest of the glacier and falls into the sea during a process known as calving. 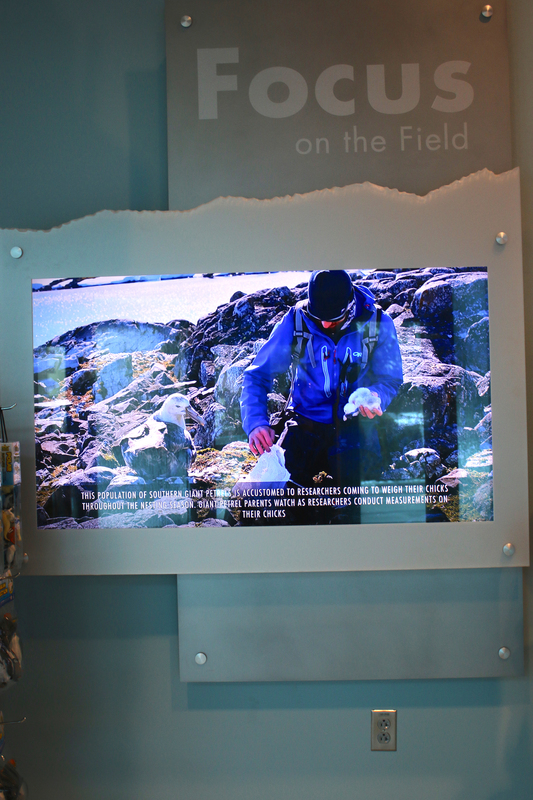 Just outside the Drake Passage Gift Shop, Focus on the Field features the Detroit Zoological Society’s own Matthew Porter, a bird department zookeeper who had the rare and extraordinary opportunity to spend the 2015-2016 austral summer doing field work for the Polar Oceans Research Group in Antarctica. Matthew studied adélie penguins, chinstrap penguins, gentoo penguins, brown skuas, south polar skuas and southern giant petrels. Learning about the Antarctic ecosystem while journeying through Polk Penguin Conservation Center may compel you to want to help in some way. 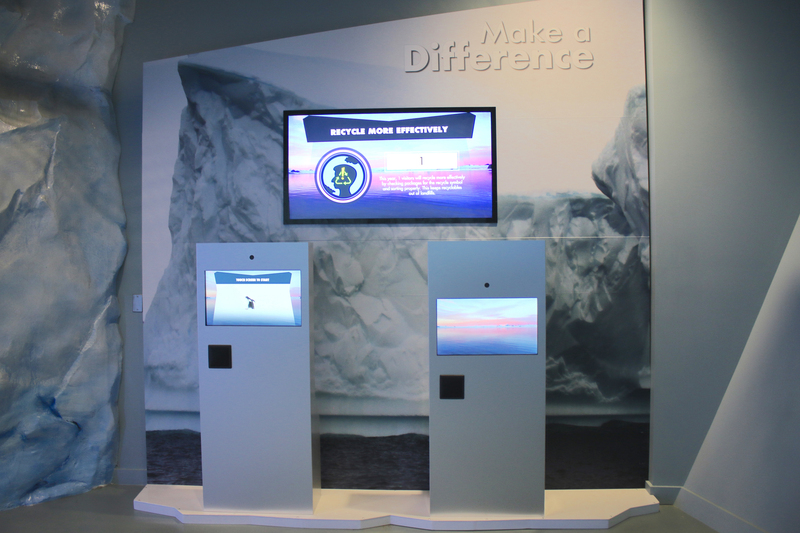 Before exiting the penguin center, visitors have the opportunity to Make a Difference in the Antarctic Gallery. The Make a Difference kiosks guide you in finding ways to help. Whether it is buying your groceries locally, changing your home lighting to energy-efficient light bulbs, or riding your bicycle to work, you can make a difference with every step you take. The machines allow for you to take a picture of yourself, which is then placed onto a digital card that includes your pledge as well as facts about sustainability and the hashtag #MakeADifference. The digital card is emailed to you, with the option of also posting to social media sites to share with your friends and family. All those who pass through the Polk Penguin Conservation Center have the ability and opportunity to join us in our mission of Celebrating and Saving Wildlife and leave a lasting, positive impact on the Earth. In a number of instances, the work we do to enhance the welfare of the animals at the Detroit Zoo is a result of collaboration and partnerships. One such partnership is with Madonna University. Students enrolled in a class that is part of the humane education curriculum join us each semester to undertake projects that will benefit the animals. We work with animal care staff to select projects suited to each species and the students are responsible for learning about that species to better understand the impact that their project will have on the animals’ welfare. The students are divided into three groups and each group is assigned a particular project. The groups work with mentors from the Life Sciences division and over the course of several weeks, complete their project. On the last day, all of the students get the chance to see the results of all of the projects in order to gain more appreciation of the various ways in which we can positively impact animals living in the care of humans. Over the course of the last few years, the Madonna University students have participated in projects benefiting warthogs, amphibians, giraffes, gorillas, reptiles, rhinos and birds living in the Free-Flight Aviary, to name a few. This year, the students will help us to modify habitats for giant anteaters, flamingos and kangaroos and wallabies in the Australian Outback Adventure. 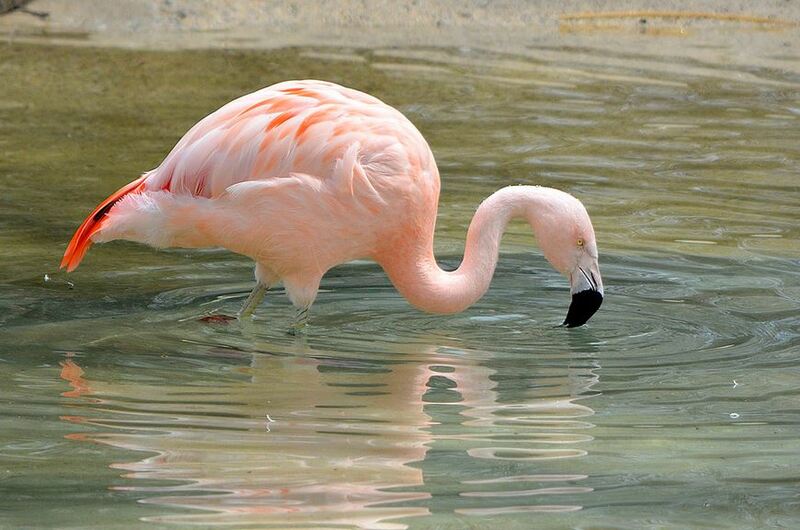 This will involve the creation of nesting areas for the flamingos, as well as planting shrubs for the anteaters and kangaroos in order to add more complexity to their environments and create additional areas of shade. These types of modifications are important to ensure that animals encounter novelty and have more opportunities to display species-typical behaviors. This wonderful partnership is an example of how the Detroit Zoo provides educational and inspirational opportunities for students and is always finding ways to design engaging habitats for the animals. 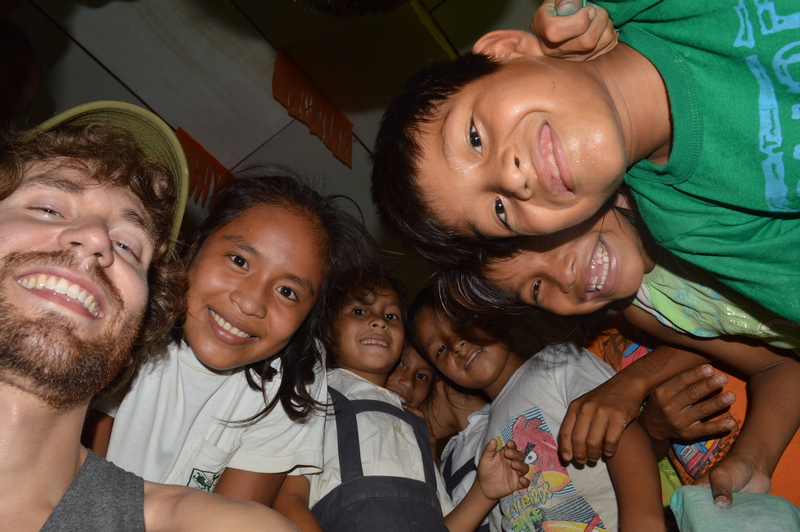 During the second week of our visit to Peru as part of the Adopt-A-School program, we continued to deliver donated school supplies to our final eight communities along the Amazon and Napo rivers. Students and teachers received pens, pencils, rulers, notebooks, textbooks and more that will assist with making learning accessible and achievable. The students showed their appreciation for this invaluable academic support by thanking the volunteers and giving presentions cultural performances, many of which include ecological messages. Creating reverence and respect for the natural world starts in childhood, is re-enforced through schools and grows into adulthood. In some of the long-standing Adopt-A-School communities, some former program participants now have children within the program, further expanding conservation and preservation as a family value. In addition to school supply deliveries, the second week of the Adopt-A-School visit includes a service project. This year’s project is taking place at Centro Unido and includes constructing a school kitchen for the government-funded Qali Warma (Quechua for “strong child”) meal program. This will allow parents to cook both breakfast and lunch every day at school to further incentivize attending class by providing meals, while making learning easier by removing hunger as a distraction. While construction is going on, some volunteers work with the children, providing individualized attention that is hard to come by in a classroom setting. 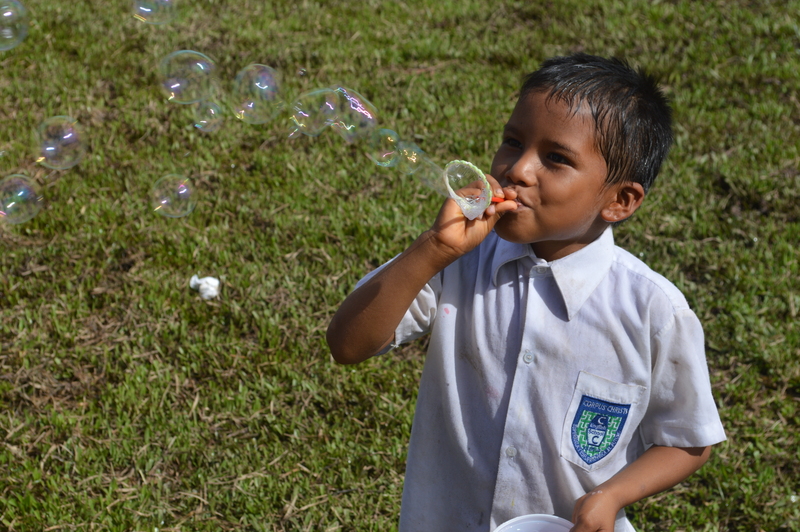 We do many crafts and art projects with the students, exposing them to different learning experiences that are sometimes missing in the rote learning style of Peru. This opportunity to interact one on one with students creates new friendships and many memories. As this Adopt-A-School volunteer trip comes to an end, it is hard to say goodbye to all of the people we’ve met in Centro Unido as well as the volunteers who have committed their time, energy and finances to making this program a possibility. A big thank you goes out to all who made the 2016 Adopt-A-School school supply deliveries and service project a great success! 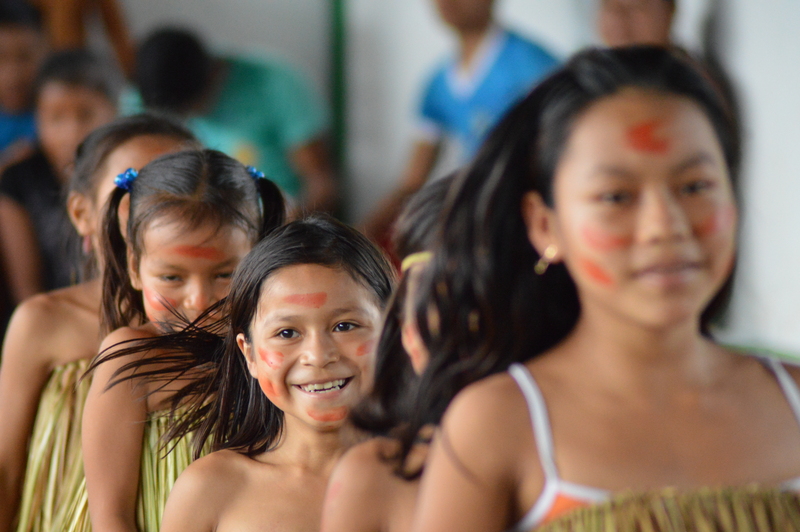 Are you interested in preserving the rainforest, one child at a time? 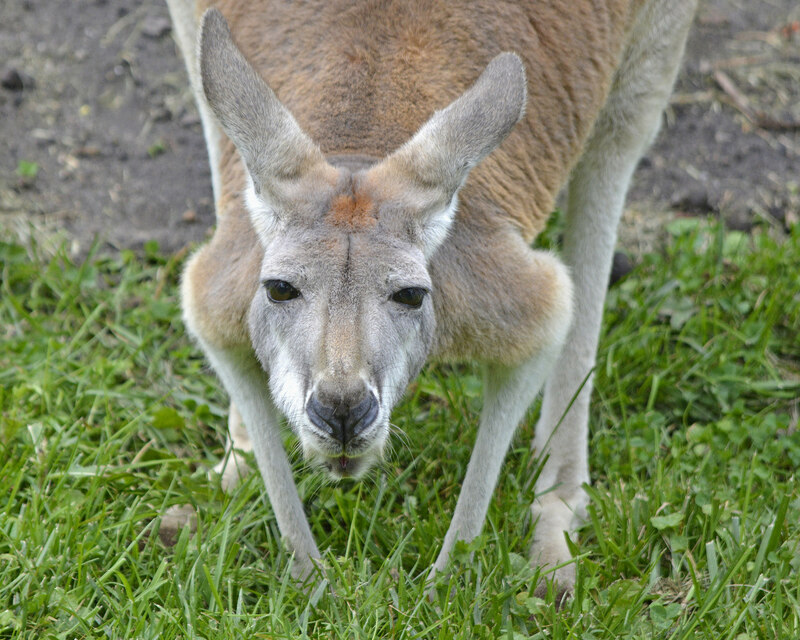 For more information on Adopt-A-School donations and volunteer opportunities, please visit http://detroitzoo.org/support/give/adopt-a-school. – Adam Dewey is an education specialist for the Detroit Zoological Society.